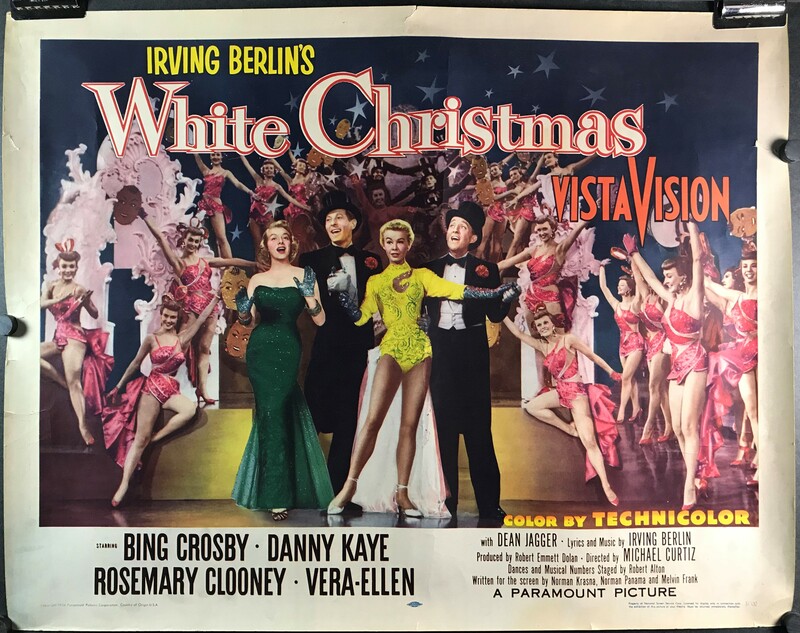 WHITE CHRISTMAS, Original Vintage Musical Poster starring Bing Crosby and Rosemary Clooney. WHITE CHRISTMAS, 1954. Original Half Sheet (22 x 28”), (72 x 92 cm) originally rolled movie poster starring Bing Crosby, Danny Kaye, Rosemary Clooney, and Vera Ellen; Directed by Michael Curtiz; music and lyrics by Irving Berlin. This Christmas classic stars Bing Crosby as Bob Wallace and Danny Kaye as Phil Davis – two friends from the Army who team up to become a song-and-dance act after WWII. The duo travel to a lodge in Vermont with a pair of two beautiful sisters who also have a song-and-dance act, but quickly realize the lodge belongs to their former commander, General Waverly. Every once in a while Hollywood gets it right: this is one of those movies a must see for all families at Christmas! This poster is in excellent original C8 – C9 rolled condition and is virtually flawless except for two small .5″ tears on the left and upper margin and some light margin creases on the left margin which will be easily healed by adding linen backing service for an additional $60 to your shopping cart below. Extremely hard to find this movie in this format and in this condition; a rare opportunity especially if wall space is a consideration. If you are local to the Texas area please inquire about framing this poster in time for Christmas!